(TibetanReview.net, Mar07’19) –In more news about early marking of the 60th anniversary of the Tibetan National Uprising Day, falling on Mar10, a wreath-laying ceremony was held at the Innocent Victim’s Memorial in the Westminster Abbey in London and the Tibetan national flag raised in front of the Guildhall in Northampton on Mar 5. The annual Westminster Abbey event was organised by the All Party Parliamentary group for Tibet (APPGT) in the UK Parliament, along with the Tibet Society UK. 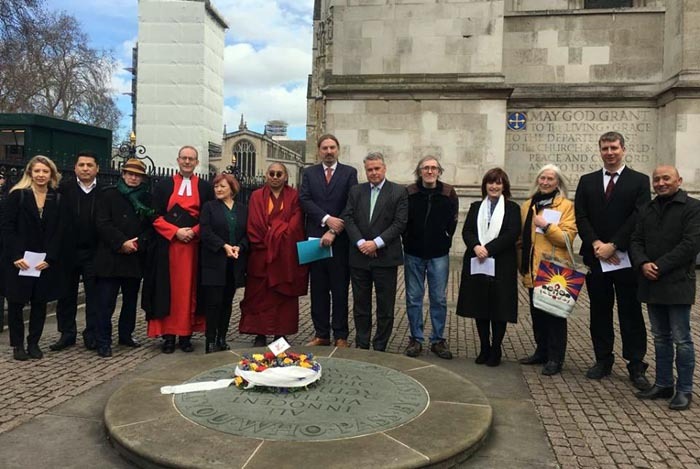 Welcome messages were delivered and prayers recited by The Reverend Anthony Ball, Canon in Residence at the Westminster Abbey and Khenpo Kadrak Ngodup Sonam, a visiting member of the Tibetan Parliament-in-exile. In his address to the gathering, Hon Chris Law, an MP belonging to the Scottish National Party and co-chair of the APPGT, reiterated continued support for Tibet and vowed to work with his colleagues in the UK parliament for a peaceful resolution to the Tibet issue. Three other UK MPs, namely Rt Hon Tim Loughton from the ruling Conservative Party and Hon Kerry McCarthy and Hon Karen Lee, both from the Labour Party, also attended the event. Representatives from Tibet Support Groups in the UK as well as Tibetans and public attended the ceremonial event. 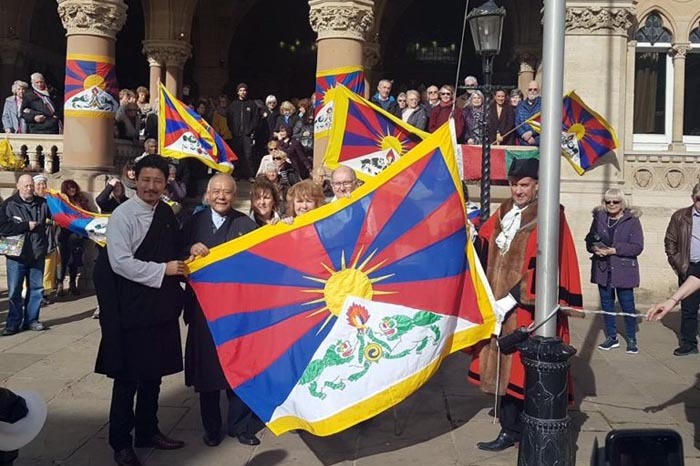 In Northampton, City Mayor Councillor Tony Ansell and The Mayoress Jayne Crofts, joined by Councillor Phil Larratt, Caroline Scattergood from Cotton’s Farmhouse, the Central Tibetan Administration’s London-based Representative Mr Sonam Tsering Frasi, visiting exile Tibetan parliament MP Mr Sonam Norbu Ratsa, and others raised the Tibetan Flag at the Guildhall for the 20th year. “This is to acknowledge the plight of the Tibetan people and mark the 60th anniversary of the Tibetan Uprising” The Mayor wrote on his official Facebook page. The event was an initiative of Caroline Scattergood who remained its chief organizer. Some 100 people were stated to have joined the flag raising event meant to express solidarity for Tibet.